Armajani arrived in St. Paul, Minnesota, in 1960 to attend Macalester College, and he painted Prayer for the Sun while a student of philosophy there. At first glance the work appears completely abstract. 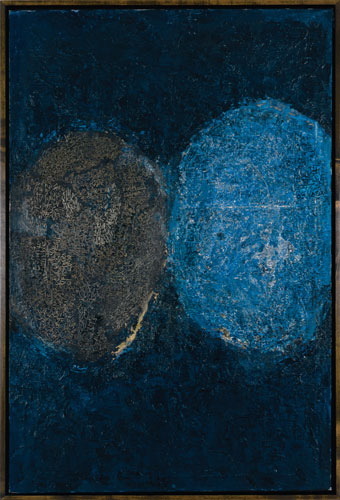 Upon closer examination, however, one can detect letters in Arabic script that Armajani scratched and buried in the two ovoid forms that seem to represent celestial bodies.1 His act of inscribing nearly illegible letters into the surface of a painting profoundly explores the pictorial relationship between words and images that fascinated both Armajani and his contemporaries. Dimensions 48 1/4 x 32 in.